These enchiladas may be different from the ones you are used to making. First, they are covered in mole (pronounced mo-Lay) not salsa and second they are not baked in the oven. 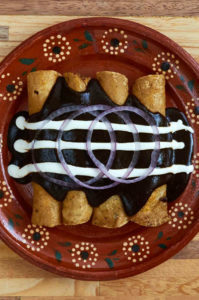 They are cheese filled but not definitely not “melty.” Enchiladas topped with mole are called enmoladas. 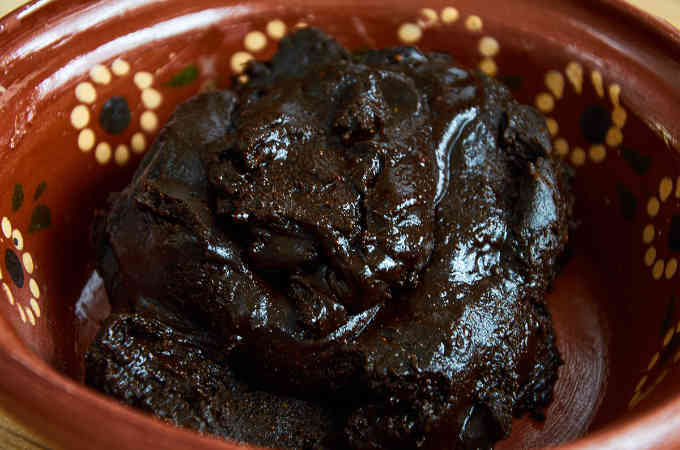 Mole is a generic term for smooth sauces made from dried chiles and they come in countless regional variations. 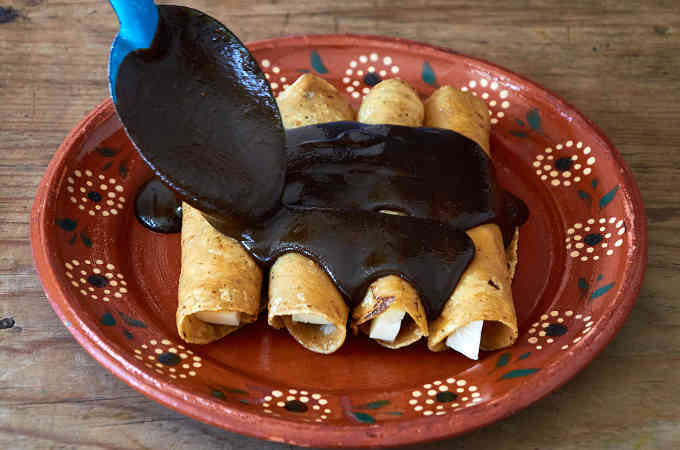 The most famous is mole poblano from the city of Puebla which most people know as the “chocolate sauce” which is the one we used for this recipe. Buy. All moles will give excellent results. Use the mole of your choice. Changing the variety of mole varies the flavor of the dish. Disclosure: Some of the links are affiliate links, meaning, at no additional cost to you, we will earn a small commission if you click through and purchase a product which helps support the site. We only recommend authentic products that we have used ourselves and love. Start by gathering the ingredients. 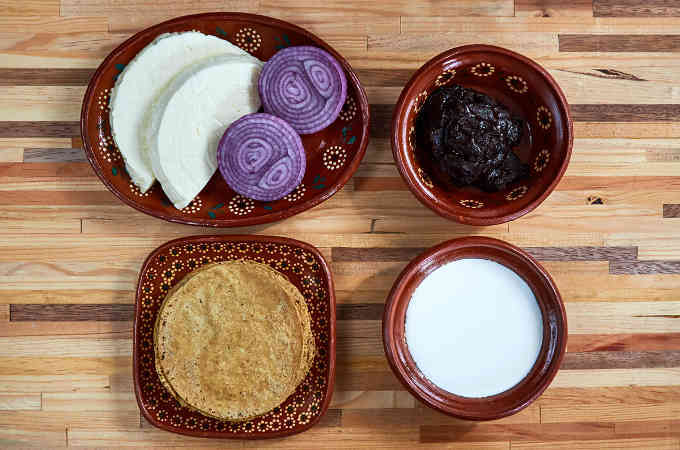 You will need 1 cup of mole paste, 4 cups chicken broth or water, 1 lb. 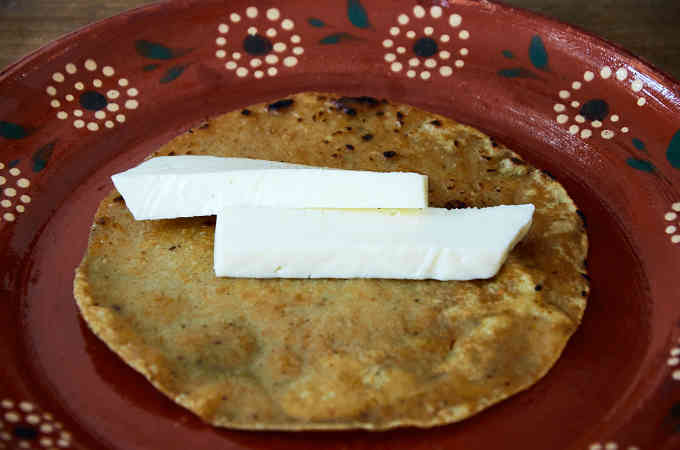 of queso fresco or panela cheese, 1/2 cup Mexican cream, 1 red or white onion, 12 corn tortillas and 1 cup cooking oil. 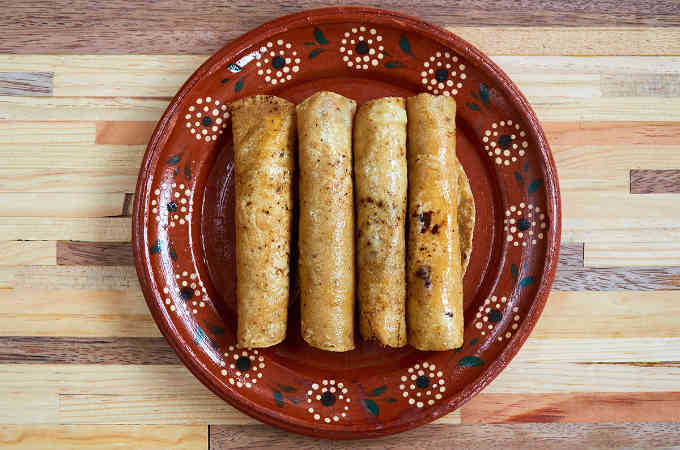 If possible, use handmade tortillas for this dish. The flavor is superior. 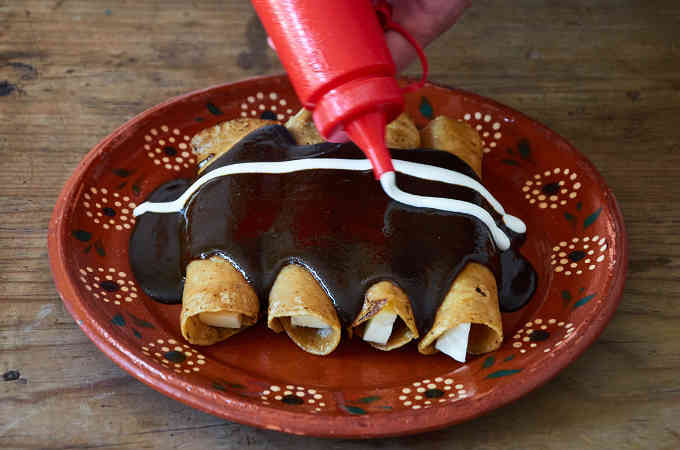 To make your enmoladas the first thing you need to do is prepare the mole. We used mole paste for this recipe. Follow preparation instructions for mole paste here. You may also be able to find ready to use mole to save a little time. We prefer using the mole paste though, better flavor. 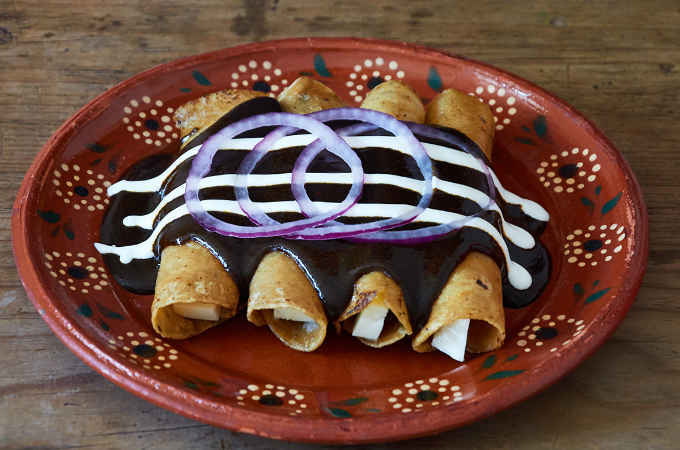 If you would like to try and make a mole sauce from scratch, try the red enchilada sauce. You can see how traditional black mole is made by hand using a metate in this video. 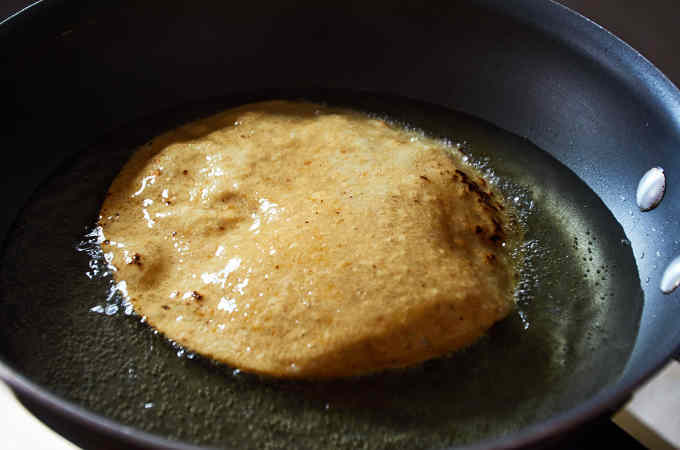 You have to fry the corn tortillas in hot oil which serves 2 purposes. 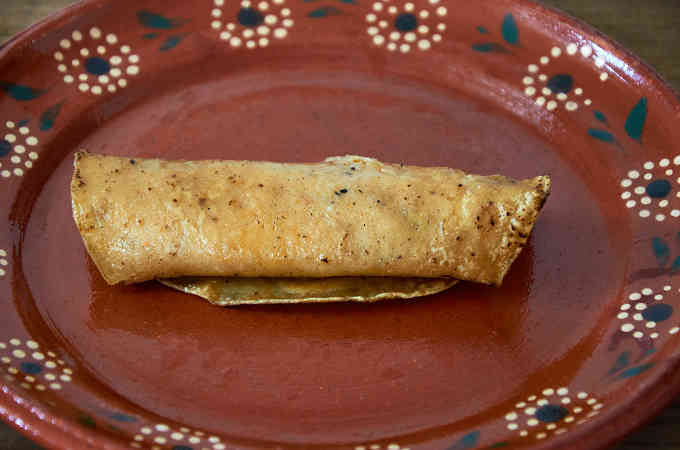 One is to make them pliable so that you can roll the enchiladas without breaking the tortilla. 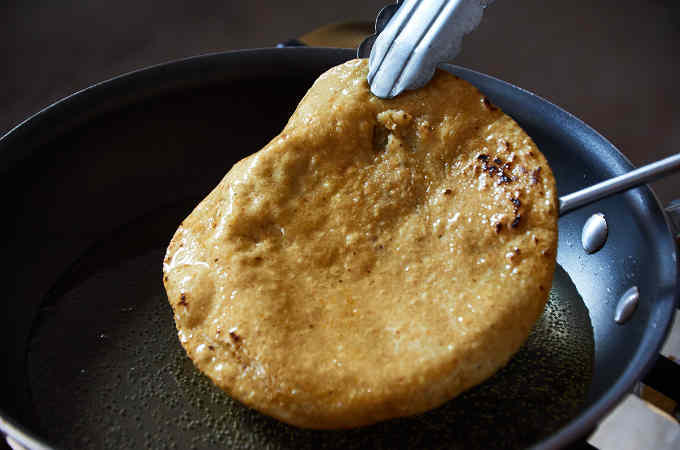 Two, frying the tortillas seals them so that they don’t absorb the sauce and become mushy. Pour 1/4″ of cooking oil (about 1 cup) into a frying pan and heat to medium hot. 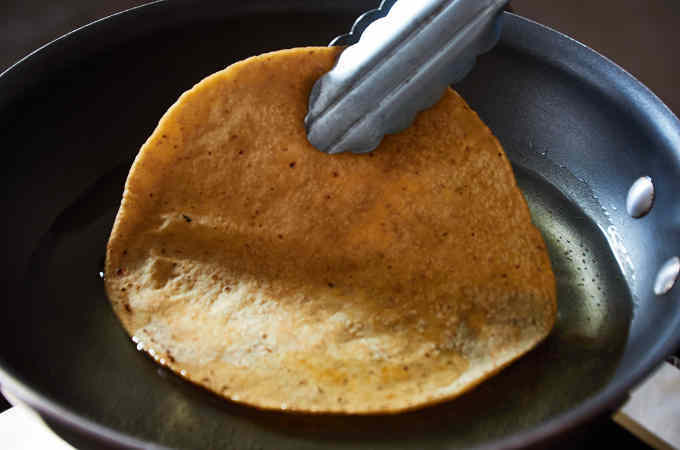 Gently lower a corn tortilla into the oil and cook for about 10 seconds until the tortilla starts to puff up. Turn the tortilla and cook for another 10 seconds. Remove the tortilla from the oil. Let the oil drain off for a few seconds. 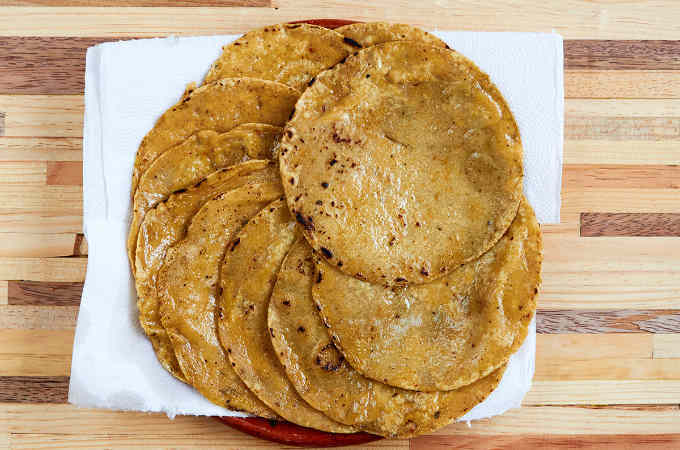 Place the tortillas on a plate covered in paper towels to drain the excess oil. Bring the cheese to room temperature before rolling. Place 2 or 3 slices of cheese on a tortilla. Place 4 rolled enchiladas on each plate to serve. Enmoladas are served warm not piping hot. Spoon the mole over the enchiladas. 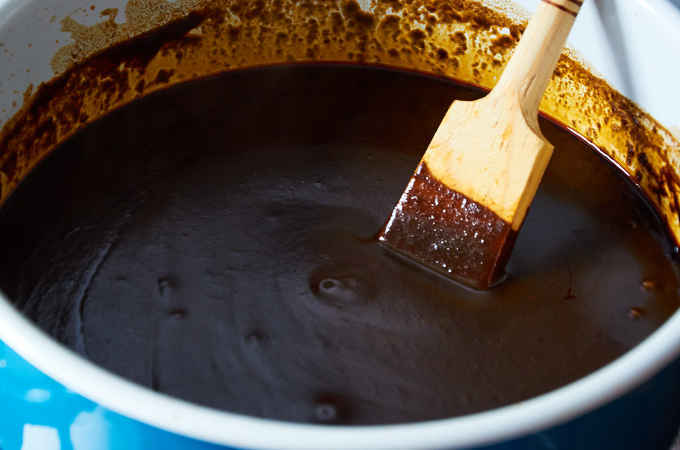 You will need about 3/4 cup of mole sauce per plate. Decorate with cream. Mexican cream is preferable to sour cream. Top with 3 thinly sliced onion rings. 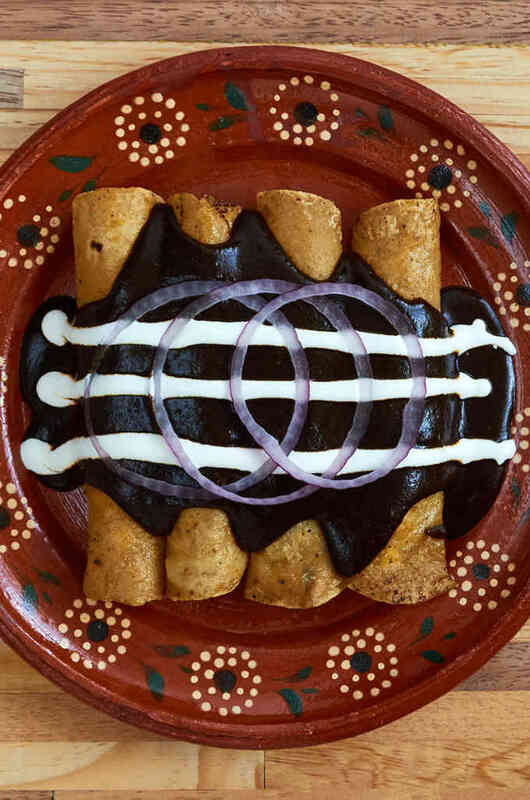 Panela cheese filled enchiladas topped with mole, a smooth sauce made from dried chiles, Mexican cream, and sliced red onion. Mole comes in many varieties. We used mole poblano for this dish. You substitute the mole of your choice. Follow the directions here for preparing the mole paste. Once the mole is ready, move on to the next steps. Pour 1/4" of cooking oil (about 1 cup) into a frying pan and heat to medium hot. Remove the tortilla from the oil. Allow the oil drain off for a few seconds. Bring the cheese to room temperature before rolling. 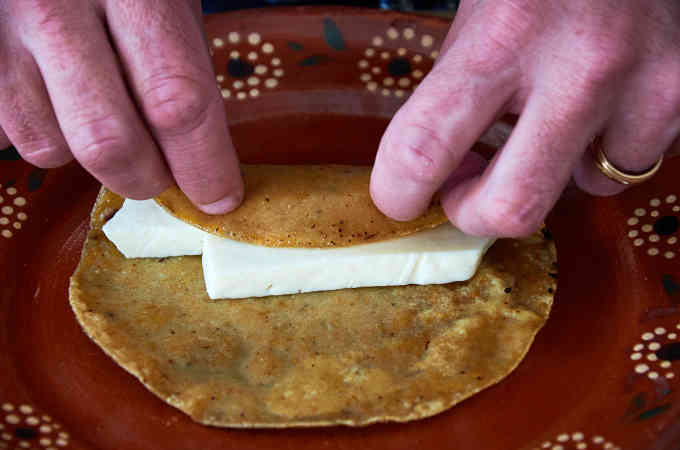 Place a corn tortilla on a plate then place 2 or 3 slices of cheese on the tortilla. Roll the tortilla until it forms a nicely shaped tube. Repeat until you have rolled all of the enchiladas. Spoon the mole over the enchiladas (about 3/4 cup per plate). Using a squirt bottle filled with Mexican cream, pipe 3 lines of cream across the enchiladas to decorate. Garnish with 3 thinly sliced onion rings. You can substitute sour cream for the Mexican cream called crema. Real crema is the best option for authentic taste. You can substitute shredded chicken for the cheese.